2 weeks of October has flew past, so I would like to take the opportunity to do a short update on what is over recently and what will be coming after this October. As you all know, October has been a really hazy month, because of the haze, the Pink Ribbon Walk which was supposed to be held on the first week of October has been cancelled. Its such a pity as this was supposed to be my first official walk. Thanks to the lovely friend Danessa for extending the invite nevertheless, and to the sponsors, thanks for having our welfare at heart. 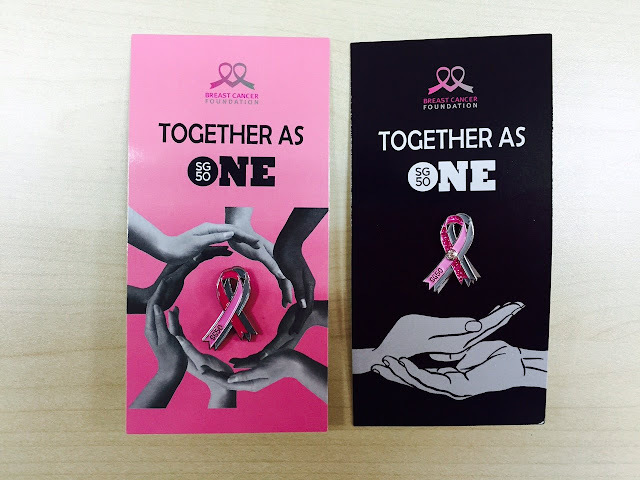 You can read about the pink ribbon walk and continue to support the Breast Cancer Society by purchasing the pink ribbons. Because of the persistent haze, I didn't manage to go out and buy my new running shoe. I need a new shoe soon because I will be heading to Melbourne next month for my belated wedding anniversary celebration and was order by my husband to get a pair of good walking shoes. He has been nagging ever since the walk and I guess I have almost ran out of excuses to give for delaying my shopping? Speaking of shoes, regardless haze or not, online shopping is here to stay. Why not hop on to ALDO Singapore outlet to shop for your new shoes instead? They have shoes for both men and ladies and is going up to 80% off currently. Stocks are running really low so don't say I never share! I spotted 2 really lovely pairs but decided to give them a miss this time round. The Grisill Loafer is left with only 1 size. Its my size however I am hesitating as my feet are very small and for shoes I prefer to test them out before purchasing (if they have the exact shoe design and if their physical store exist). For this case, even if I got it and eventually its the wrong size, I would have problem exchanging because only 1 size is left? coming up on the blog . . .
Last week, I have attended the Stender's Store opening in Plaza Singapura. You may have already seen the photographs which I have posted on my instagram. The lovely brand is from Latvian, uses natural ingredients and have many delightful natural soaps and body scrubs. If you like a skincare line with lovely and natural floral fragrance, this is one blogpost you don't want to miss reading. Last Saturday, I missed the Bulgarian Rose Karlovo Signature Tea Party because of work. However, I will be sharing about 1 of their signature rose product in my upcoming blog post. Do look forward to that as I share with you reviews of the product. Want to guess what it is? Lastly, I have received my Nylon X Vanitytrove box. You can quote "pearly10" for 10% off any Nylon vanity trove boxes purchased. These boxes are while stock last, comes with several full sized items and definitely worth much more than what you'll be paying for. I guess I will be packing some of these products together with me for my overseas trip as well. Last but not least, my lip gloss from EHA is finally ready! You can soon get to see my selected shade and share my thoughts on this product which promises a fuller, plumper and moisturized lips. Oh I love lippies and i can't wait to use them! With so many things at hand, work and juggling with my studies. I hope that this short update on what's upcoming will keep you excited and tuning in to my blog. This is the first time i attempt on such an update, do you like this idea? Share your thoughts in the comment section. Disclaimer: Photo credits to the respective brands. I did not take any of those photos. Till then, Be Confident, Be Yourself.